ABBA Silver: 'Mamma Mia! Here We Go Again' Return with us now to the enchanted isle of Kalokairi, where the sun shines, the water gleams and the populace is unnervingly obsessed with '70s Swedish power-pop — albeit the B-sides, this time out. 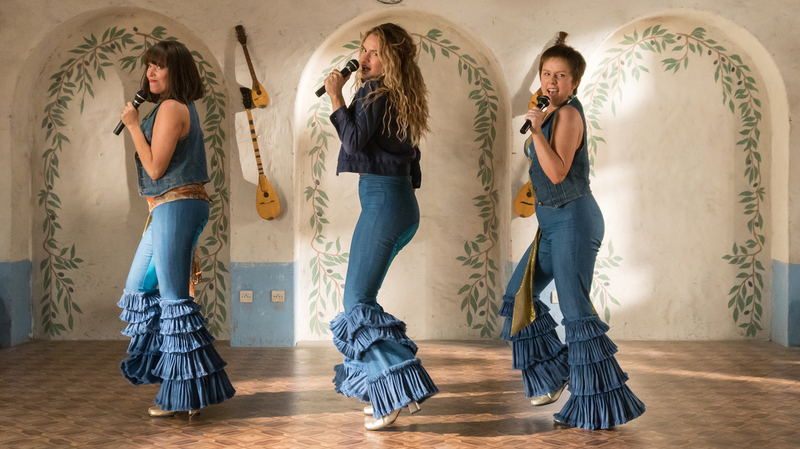 Electric Waterloo: (L to R) Young Tanya (Jessica Keenan Wynn), Young Donna (Lily James) and Young Rosie (Alexa Davies) feel the beat from the tambourine, oh yeah, in Mamma Mia! Here We Go Again. 1. Does Pierce Brosnan sing in this? Tell me Pierce Brosnan doesn't sing in this. But. BUT! They've learned from history. This time out, he reprises the same song he so mercilessly pummeled in the first film, but much more gently, more briefly and in a melancholy key, which rather neatly serves to cauterize the wound and keep the infection from spreading to the rest of the film. And in fairness, let's just note that the song in question, in both films, is 'S.O.S.' — literally a cry for help. Come on, they had to know what they were doing, there. 2. The trailer says Meryl's character is dead, but she's on the poster. So what gives — just flashbacks from the first film? I get it, it's a perfectly fair thing to ask — but you don't really want to know the answer. You think you do, but you don't. The film works better if you go into it hovering in a state of Heisenbergian uncertainty, Streep-wise. Next question. 3. Do I need to re-watch Mamma Mia! before going in? You mean, to refresh your memory of that film's massively complex world-building, Byzantine inter-character relationships and densely layered mythology? Uh, yeah, no. Really no. In fact, it's probably best to go in fresh-ish, because this film plays fast and loose with facts and chronology clearly established in Mamma Mia!, in ways that may subtly disconcert the nerdiest among you. These variances turn out to be all for the good, however. You may recall how, in the 2008 film, when Streep's character Donna first catches a glimpse of the three middle-aged men who, years before, may have fathered her daughter — Brosnan's Sam, Stellan Skarsgård's Bill and Colin Firth's Harry — she briefly imagines them as they were in their youth. Which is to say, given the blessed cheesiness of the whole cinematic endeavor: a middle-aged Firth in a "punk" wig, eyeliner and studded leather collar, a middle-aged Skarsgård in a "hippie" wig and flowered shirt and a middle-aged Brosnan in a "biker" wig, complete with headband and particularly woeful mustache-situation. Given that Mamma Mia! Here We Go Again concerns itself with how those youthful couplings played out, we must force ourselves to briefly entertain the chilling notion of a whole freaking movie with Brosnan, Skarsgård and Firth assaying versions of their younger selves — and then, thankfully, dispel it into the ether of What-Might-Have-Been. Consider it a mercy that the filmmakers instead shunted the entire janky-wig budget into hiring three wan twinks to play Young Sam (Jeremy Irvine), Young Bill (Josh Dylan) and Young Harry (Hugh Skinner), respectively. Yes, several details of how Donna met these men differ markedly from the history we got in Mamma Mia!, but the three young performers possess markedly better voices than their older selves, so call it a net win. What may not be clear is that her screentime clocks in at just over sixteen minutes. Also, according to a passage of Streep dialogue in the 2008 film ("Somebody up there [point to the heavens] has got it in for me. I bet it's my mother.") Cher's appearance at the film's climax should logically inspire, among the other characters, a good deal more existential dread, if not screaming terror, than it does here. Look, it's no secret that Cher is a supernatural force. But if we accept that line of dialogue as Mamma Mia! canon, she may in truth be a Vampyr. The script is not forthcoming, but what other conclusion is possible? She does get a number to do, though, and it's really pretty great. So, you know: undead, schmundead — at the end of the day it's Cher singing in a exquisitely tailored pantsuit, so it's a win. 4. Mamma Mia! already trotted out 16 of the 19 songs on ABBA Gold, the best-of album that contains their most-beloved hits. What songs are left to build another whole movie around? Rest assured that those three orphaned songs from ABBA Gold get their time in the sun, at last. Also know that of the 18 songs on the Mamma Mia! Here We Go Again soundtrack, six — fully one-third — are repeats from the first film. But they're no mere retreads. Thanks to director Ol Parker, every last one of the returning songs merits an empirically improved presentation than it garnered in the 2008 film: Bigger, splashier, more involved, more joyous, and, where appropriate (and it's usually appropriate, because: ABBA), infused with a go-for-broke, Busby Berkeley sensibility. And when sung by the preternaturally charismatic Lily James as Young Donna, delivered with a range of emotion, and a technical skill, that kind of, faintly, dazzles. The production of "Dancing Queen" that sits like a colorful, heedlessly cheesy jewel in the center of Mamma Mia! Here We Go Again borrows the base elements of the 2008 film's mounting of the same song — and transforms them, alchemically, into ABBA gold. It's ecstatically shot, charmingly choreographed and sunnily performed. Hear my prediction: Once this film makes its way onto streaming services, clips of this number will live in hundreds of thousands of browser windows, waiting to be tabbed over to, and clicked upon, as dependable, desperately needed mid-afternoon mood-lifters. So, yes: Those three overdue songs from ABBA Gold? And those six songs from Mamma Mia! newly mounted and reinterpreted? They're not the problem. It's the others. Half of the songs in the movie are comparatively little-known, C-list ABBA B-sides — with the understanding that the word "comparatively" is doing a lot of heavy lifting in that phrase, given that what we're comparing them to are songs that have infiltrated the very fabric of modern culture through radio, elevators and dentist offices. Even if you belong to the subset of the population who knows all the words to "When I Kissed The Teacher," "Angel Eyes," or real snoozers like "I Wonder (Departure)" and "I've Been Waiting For You," you have to admit that they lack the uncanny, insinuating power of ABBA's chart-toppers. Sure, they're exquisitely constructed, deceptively simple feats of close-harmony power pop, but when so many numbers lack the cultural inescapability of, say, "Fernando," it leaves extended stretches of the film ripe for pee-breaks. 5. Is Christine Baranski an enduring, inviolate gift to the world, the final and irrevocable proof of a benevolent higher power that seeks only what is best for humanity? 6. How come, when it came time to make a sequel, they didn't just Rosencrantz and Guildenstern Are Dead this thing, and re-tell the original film's story from the point of view of those thankless, long-suffering (and hot-looking) members of the hotel staff, whom the main characters kept pointedly ignoring? I suspect it has something to do with the fact that Mamma Mia's whole sudsy, conflict-free Who is my Father? storyline just wasn't compelling enough to return to. Not that the plot of the sequel is The Brothers Karamazov or anything — basically, Sophie wants to throw a party and complications ensue, while we witness flashbacks of her mother's whirlwind courtships. But at least there's more to chew on than there was in the first film, which, when you break it down, was really just a particularly tuneful, sun-splashed episode of Maury. 7. What wine pairs best with this film? Something cheap and cold and fruit-forward, definitely. Nothing even remotely complex. Understand going in: This is the kind of movie for which a not-insignificant portion of your fellow opening weekend audience members will have pre-gamed. And goodness knows I'm not advising you to pop the bag out of the cheapest box of wine you can find and smuggle it into the theater with you. ... But if you do, make it a rosé. Or wait — even that's too snooty. See if you can still find a box that's just labelled "Blush." 8. Blush. Got it. That reminds me: Just how basic is this film? Oh, who cares? Really. Why are you so eager to go and slap a snide label like "basic" on this thing? Whom are you trying to impress? It's got (mostly) great songs, sung by (mostly) people who can sing, and a story that evaporates like breath on a windowpane. The scenery's gorgeous, as is the cast, and it's got Cher. Why do you need it to be anything more than that? Why must it be capital-G Good? Why can't you just enjoy, on a sweltering summer day, something that's simply capital-F Fun? 9.When should I pee so I don't miss Cher's big number? If you dash out when, during the climactic party, Seyfried, Baranski and Julie Walters Who Is Not Repeat Not Judi Dench Even Though She's Rocking Dench's Hairstyle So Your Temporary Confusion Is PERFECTLY UNDERSTANDABLE launch into the soporific ballad "I've Been Waiting For You," you should be good to go. 10.What should I do if the screening I attend isn't filled with women and gay men who are day-drunk on blush wine? In that highly unlikely event, immediately and calmly make your way to the nearest exit, which — remember — may be behind you.